Why should you buy a barber's cape? 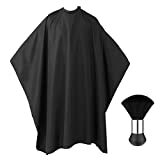 A good quality barber’s cape makes your life easy in many ways. If you are an owner of a professional salon, they are a must-have to keep you customers happy and keep their clothes free from stray hair. 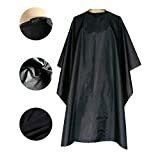 If you are used to styling your own hair or that of your kids, it’s time to say goodbye to make-shift arrangements and invest in a durable barber cape. There are several colors and qualities to choose from. Finding the right product can be difficult—but this buying guide will help you choose the best barber cape that meets all your requirements. 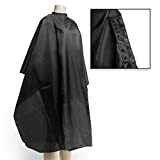 Capes with Velcro closures: They provide a good protection, but with time, hair starts clogging the rough bristles on one side, which can be difficult to remove. Capes with snap closures: They are better than Velcro, provided the buttons are made of durable material. These are considered to be the best option. They are reliable and long-lasting. 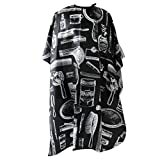 Capes with magnetic closures: These capes use magnetic buttons to remain closed. 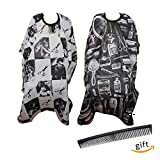 Stay away from cheap products: There are several types of barber capes available in the market at throwaway prices. However, most of them are made of low-quality material which frays easily and has to be replaced frequently. 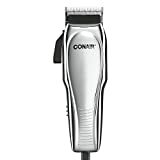 After going through thousands of barber cape reviews, you would be better off selecting a product that may seem a bit expensive at first, but provides good value for the money. Bright happy designs: Interesting colors and off-beat designs will certainly get you a lot of compliments and can be good conversation starters. 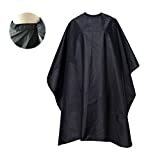 Check the material: Synthetic, waterproof materials are usually preferred for barber capes, as they are comfortable and do not require much maintenance. They can be easily hand-washed or machine-washed and dried quickly. 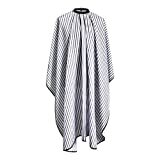 While selecting the material for your cape, ensure that it is easy to wash and dries quickly. Crinkle-free materials are easier to maintain—they also do not accumulate hair residues. Smooth shiny materials should be preferred over rough finishes because stray hair has a tendency to cling to rough surfaces or surfaces that produce static. Many manufacturers mention the word “non-static” to emphasize that fact. 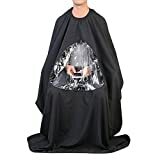 Check the dimensions: Ideally, you are not going to buy a separate cape for every member of your family or every other individual who happens to visit your salon. You must go for a size that fits all. 45 inches to 58 inches should work for everyone--from adults to children. 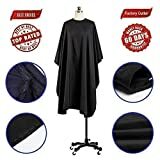 The cape should be long enough to reach your knees and cover your sides, back, and elbows when sitting. 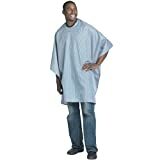 Capes that leave a gap on the back are not an ideal choice--your clothes may get wet or soiled. Many reviews point out that capes that are shorter at the back leave the lower back exposed to falling hair. 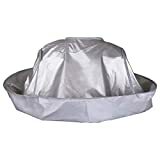 Opt for adjustable neck closures: Neck closures should be large enough to accommodate any size. There should be clasps or drawstrings on the neck that can be fastened securely to provide a comfortable fit. 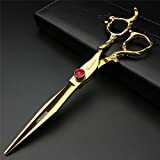 They should also avoid cut hair falling in between any gaps at the neck. 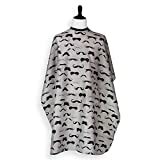 Ensure the cape is chemical-resistant: You should look for materials that do not stain easily and are resistant to chemicals used in hair dyes and bleach. Choose personalized capes: Some companies agree to print your monogram on the cape. It can certainly be appealing, especially if you own the salon. Docooler is a well-known name in this area. Their products are reliable and durable. Barbers capes from Docooler use the best quality materials and have an excellent finish. Betty Dain produces a line of high-end products that are chic, yet dependable. They offer a lot of choice in terms of color, designs, and extras. Products from Shaving Factory are of high quality and are a favorite among customers, especially because of their elastic neck bands, giving a range of options to adjust for neck size.